McKee, Kenneth (Kenny) November 6, 2018. Suddenly at home. Dearly loved husband of Blossom and much loved father of Warren, Sharon and Terence, dear father-in-law of Karen and Natalie, cherished grandfather of Jordan, Erin and Oliver and great grandfather of Katie. Service in S. Clarke & Son’s Funeral Church, Newtownards on Friday at 12.00noon. House Private. Flowers welcome or donations may be sent if desired to Air Ambulance NI c/o S. Clarke & Son Funeral Directors, 12 Court Square, Newtownards BT23 7NY. 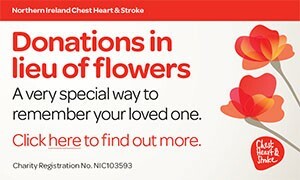 Flowers welcome or donations may be sent if desired to Air Ambulance NI c/o S. Clarke & Son Funeral Directors, 12 Court Square, Newtownards BT23 7NY. I am sorry to tell you that Kenneth (Kenny) McKee has passed away.